Grace College and Seminary, Winona Lake, Indiana, this Saturday morning, May 14, conferred degrees at the Associate, Bachelor, Masters, and Doctorate levels on 501 recipients. 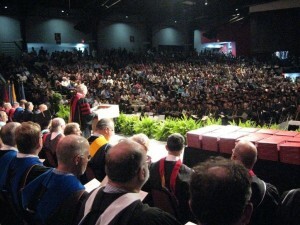 Here Grace president Dr. Ron Manahan is shown addressing the gathered graduates, families, and friends. The event was held in the Orthopaedic Capital Center. A special tribute was paid to Jeremy Mohr, the member of the college’s 2011 class who was critically injured in an accident last fall. Mohr is currently at a rehabilitation center in Atlanta, but his father was in attendance and Jeremy participated in the graduation ceremonies by Skype. Manahan also announced the opening of the Henry and Frances Weber School at Grace College, a new, unique two-year program that will begin in Fort Wayne and Indianapolis in the fall. Weber, who has been a trustee of Grace Schools, was present and was honored for his $1 million naming gift. His wife, Frances, went to be with the Lord earlier this year.